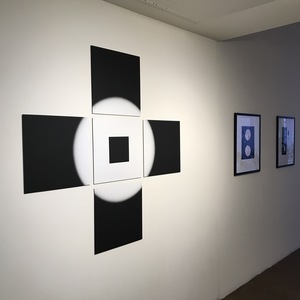 For the exhibition Three Visions from the Darkroom I wanted to create a statement piece to introduce my section. I had in mind a polyptych (multi-print) piece. This is a brief look at the evolution of the artwork. This rough sketch was my initial concept. 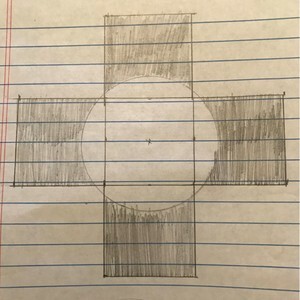 In order to resolve the problem of getting all four sections to line up creating a visually acurate circle, I created a small scale mockup. I realized there needed to be something in the center of the piece. 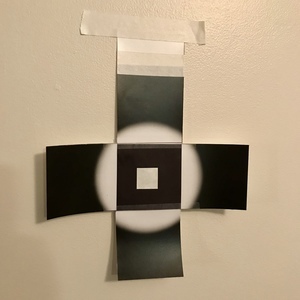 My first idea was a black field with a white photogram square. 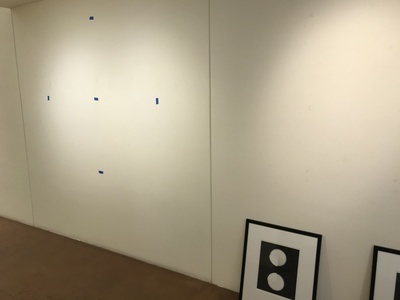 Laying out the exhibition gave me a rough idea of how the piece would fit into the space. 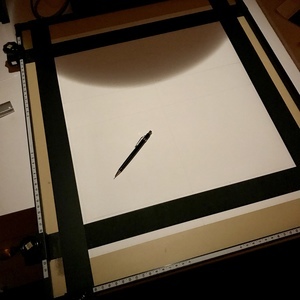 My rough layout allowed for 18" square prints spaced 2" apart for a total of 58" square. The finished piece ended up as a 53" square (17" square prints spaced 1" apart). 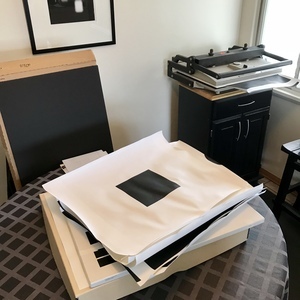 Printing 18" square images required 20"x24" photographic paper which pushes my darkroom space to the limit ... fortunately everything just fits. My paper of choice is Ilford Multigrade FB (fiber base). 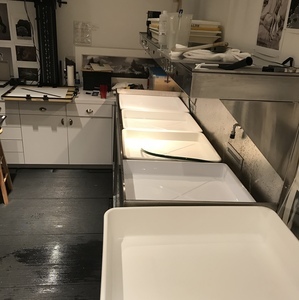 I selected their matt surface, it provides a beautiful surface and eliminates distracting reflections that can be an issue with the glossy surface. To create the circle I used four identical prints from the same negative. Scaling up from my initial small scale mockup required some math (not my strong suite) and on-the-fly tweeking of the layout. 90% of my time in the darkroom creating this piece was getting everything setting up. Printing four idential prints was quick and easy. 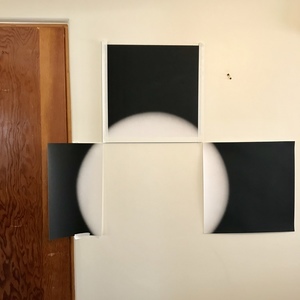 Once the prints forming the circle were done I created three options for the center photogram. 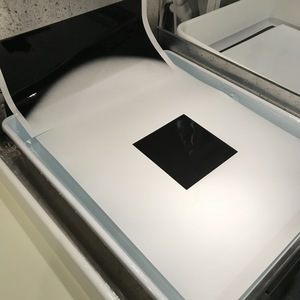 Here I'm using a test print of the circle to match tonality of the light gray background and black square photogram. Out of the darkroom and on to the finishing process. 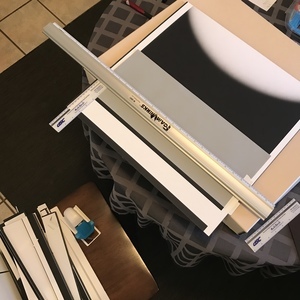 New Mexico's dry climate makes print flattening a very necessary step. Fortunately I still have my trusty drymount press. 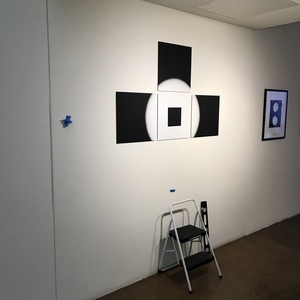 For this exhibit I decided to present the images flush mounted on 3/16" black foam board with a reverse bevel for a sharp edge. The prints were spray mounted onto the foam board. NOTE: This piece is being presented in the exhibition as an experiment and not museum quality finished work. A more archival presentation option is being explored. Testing spacing and final trim size. Cutting the reverse bevel old school. One issue with the matt surface is that it is very susceptible to damage. A piece of drawing paper between the straight edge and print solved the problem. As a perfectionist I know there are always little things that could have been done better, however I am very happy with the final piece. As I place the final print my mind is busy with visions of bigger installations!